The story of Edna Clarke Hall’s long life (1879–1979) did not turn out the way she had planned. 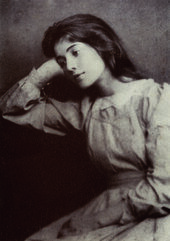 At the Slade – where she studied in the 1890s and which, since its inception, had welcomed women as equals of men – she had won prizes and a scholarship. There, Edna and her friends Gwen John and Ida Nettleship could believe in art as a profession, and that, as women, they could have a profession at all. But the Slade lulled them into a false sense of freedom. Though Gwen escaped to independence in France, Ida would marry the Welsh artist Augustus John and die, aged 30, after the birth of her fifth child. Edna slipped into a lonely, loveless marriage at 19. It checked her open, ardent, impulsive nature but did not destroy it. Challenged by a critical husband who lacked empathy for her artist’s soul, she retreated within herself and it seemed that her creative life had died. Edna worked in snatched moments: ‘I wanted to draw a subject quickly, seize it, convey my impression.’ She worked in watercolour and in pen and ink, mediums that satisfied both her impulsiveness and her need for discretion. The examples of these illustrations in Tate’s collection pulse with the urgency, fluidity and economy with which they were sketched. Here the ink has pooled, there the brush has dried – perhaps less technique than a desire to commit to paper. In her vision of the novel all is in tumult – elemental, rain-washed and mud-soaked; all is feeling rather than place. These are no sentimental storybook illustrations: closer in style to Paula Rego and Balthus than to her Victorian contemporaries, they capture the strange, almost allegorical nature of Brontë’s novel. They feel organic, imbued with the story’s same ferocious energy, becoming increasingly loose and impressionistic over the years. Extraneous details – often faces – are stripped away and everything is suggestive and essential: the spare cross-hatchings that stand for trees, the sepia squiggles that are scudding clouds, the single wash of blue through a dress. They are almost all emptied of colour – except when filled with it, as when Catherine and Heathcliff and their world are a single, harmonious flourish of peacock blue. Edna sketched from reality too. On the back of her illustrations her ordinary world reveals itself – a placid cow, a serene swathe of common with neat trees and bucolic figures – but these do not inhabit her interior world, and the difference is tangible. Edna continued to exhibit her work, though at home she had learnt to cower from criticism. In the 1920s, when a new generation of women were carving out their freedom, she became the reluctant poster girl for domesticity. ‘Woman Painter’s Romance. Art Sacrificed to Motherhood’, declared one paper and others followed suit. Set against the glittering trajectory of her friend Augustus John’s career, the comments seemed to have foundation. Edna published a rebuttal declaring that children and creativity should be nurtured with equal care. She knew that she was fulfilling her potential, but it was a private industry, just as writing had been for Emily Brontë. Edna took little care of her work; the process was the point. When, in 1941, she was told that much of her work from that time had been destroyed by the Blitz, she burst out laughing. The event essentially marked the end of her life as an artist and she never reclaimed those pieces that had been salvaged from the wreckage. This year is the bicentenary of Emily Brontë’s birth. Edna Clarke Hall’s work is available to view by appointment. Anna Thomasson is a cultural historian and writer living and working in London. Her first book, A Curious Friendship, is published by Pan Macmillan.